Duke phenom Zion Williamson is obligated to wear Nike sneakers because of a contract with the shoe company that makes his school millions of dollars. Let’s start here: The first weekend of the NCAA Tournament is the one of the best (if not THE best) sporting events of the year. Everything about it rocks — from the nonstop schedule of games across the first two days to the breakout stars that emerge with them, for the impossible-to-predict brackets and the office pools that go with them, from the ratings gold of the men’s tournament to the ever-growing allure of the women’s bracket, March Madness has absolutely earned a place on any ranking of top sports days on the calendar. But let’s also admit this: The three weeks of the NCAA Tournament can no longer continue to hide the sins of their master, to make us forget the corrupted, hypocritical, and misguided entity that is the National Collegiate Athletic Association. With every academic entry scandal, every outdated adherence to an old definition of amateurism, every sordid recruiting story laid bare in a courtroom, every tone-deaf tweet, every public stance against gambling, or every exploding Nike, the NCAA continues to unmask itself as a bad-faith organization whose words purport to have student welfare at heart but whose actions instead emphasize the financial bottom line and the desire to maintain power. How about that recent Justice Department investigation that rocked the world of elite academia? Though not a sports story in full, the role that sports played in presenting a side door through which rich, connected applicants could buy their way into schools such as USC, Stanford, UCLA, and Yale cannot be ignored. The use of slots for nonscholarship, recruited walk-ons was the linchpin in the scandal, with coaches and administrators using that relatively unmonitored practice to create their own profit-making scheme. While the NCAA is intent on keeping track of every slice of pizza not paid for or every autograph charged for by its highest-profile (read: revenue-generating) athletes, it has no idea there were athletes listed on rosters who don’t actually PLAY for the team in question, and in some cases, NEVER even played the sport? Yet if the ongoing scandal that ensnared sports such as water polo (the coach of USC’s national powerhouse men’s and women’s teams was fired), soccer (both UCLA’s men’s coach and Yale’s women’s coach resigned, the latter cooperating with investigators when his duplicity was discovered), and sailing (Stanford fired its coach) has drawn headlines for its sheer scope, there are many more examples of hypocrisy. 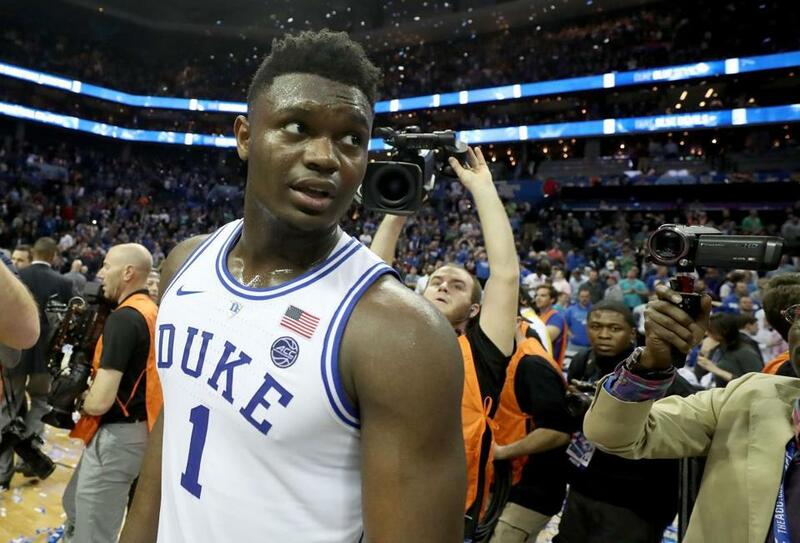 Who saw Zion Williamson’s sneaker fall apart just seconds into a game against rival North Carolina, leaving the Duke star and presumptive No. 1 NBA draft pick writhing on the court in pain, and wasn’t disgusted to remember that he had no choice in brand of footwear? That the exceptionally talented Williamson would sustain a knee injury that kept him out of action for weeks certainly made the story newsworthy, but the fact that his university makes millions off a contract with Nike while he makes nothing was what made it cringe-worthy. But remember, the athletes are amateurs, and cannot profit off their athletic abilities while competing for an NCAA institution, where a full ride on tuition is supposed to be enough compensation. There was a time that was true. But times have changed, and the more and more money that gets poured into the game they play — CBS reportedly pays the NCAA nearly $900 million PER YEAR for the right to broadcast the men’s tournament — the less fair it is that they have no opportunity at all to benefit from the hours and effort they put in. Speaking of those hours, if you missed the tweet sent out by the NCAA’s official Twitter account that purported to show a typical day in the life of an NCAA student-athlete, do yourself a favor and check out the lesson in tone-deaf stupidity. In it, a (presumably) paid actor smiles his way through a somewhat hectic day, rising in time to get to class, take a leisurely jog around campus, hang out with some friends, and get to bed early enough to be ready to do it again. The video was rightfully skewered online, and not by just anybody. Quote tweets from Saints running back Alvin Kamara (“boy what the hell is this” accompanied by laugh-out-loud emojis), Cowboys cornerback Byron Jones (“A brisk run around campus, the energy/attentiveness in class, going to sleep with a smile on your face? This video is NOTHING like being a student athlete”), and Eagles’ defensive end Chris Long (“The level of tone deafness that it takes to make this video and casually drop it in the blue check, shark infested deep end of twitter on the eve of the most profitable stretch of action the NCAA enjoys is remarkable”) were mere precursors to the genius of Eagles linebacker Emmanuel Acho. Acho’s parody video, complete with predawn lifting sessions, mad-dash meals, and exhausted classes has been viewed more than two million times. Not unlike the ratings for the tournament. But while you watch, don’t forget to heed the warnings of the NCAA, where signs apparently posted in arenas across the country warn against the evils of gambling. “The NCAA opposes all forms of legal and illegal sports wagering,” it says, with a dontbetonit.org tagline at the bottom. However, if you do want to get in on the action, just head over to the NCAA’s own website and make your picks. Webster’s dictionary defines hypocrisy as “the practice of claiming to have moral standards or beliefs to which one’s own behavior does not conform; pretense.” We can make it shorter: NCAA.